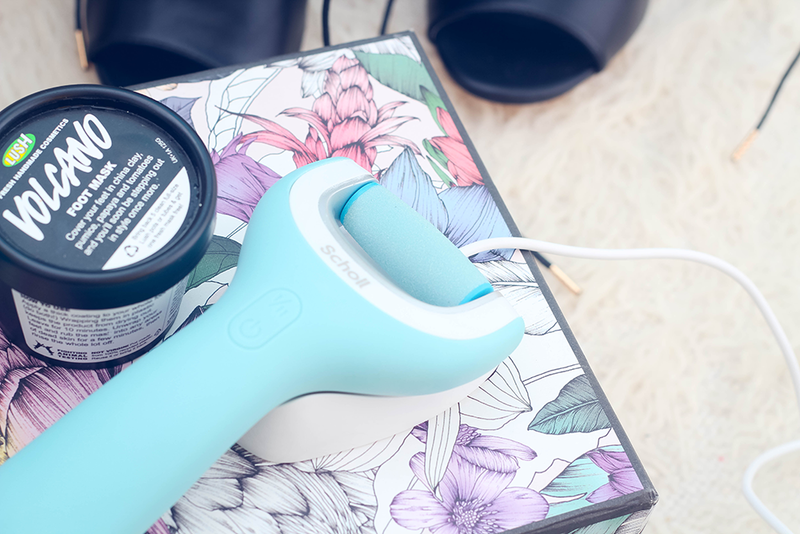 You know I love a Scholl foot pedi, hell I was one of 5 in a YouTube ad supporting the last one and each Velvet Smooth foot file seems to get even better! The new one on the market as of late; Scholl Velvet Smooth Wet and Dry Foot File. The special features for this one is in the title, that you can use it wet or dry, making it useable for however you feel comfortable. It's rechargeable, YES rechargeable! I love anything rechargeable it saves on batteries killing out on me and it keeps this as powerful as needed with each use. A charging dock with a USB attachment & detachable plug is included in the box, so if you want to travel with this it can be used on a laptop or a plug. The charging plate has two metal contact points that you need to align the handle onto so do make sure it's somewhere that it cannot be knocked over. My only question is, if there's a successor - how can it get any better? I try to do my feet at least once a week a full routine on them to keep them smooth & unexpectedly presentable. Like my beauty routine, I've tried to cut this one down with products also but I pretty much keep them in the Scholl family. I really do recommend Scholl for foot care or LUSH those are my two choices and most of what I use is by either brand. I will soak them and treat them with a Scholl Foot Soak I have (I'm not sure if it's been discontinued as I can't find it on stockists websites) but any wash will do like this Foot Soak and Fancy Free for about 10 minutes or less and clean my nails while I'm at it. TIP : If your feet are quite dry or cracked, try using the Velvet Smooth Wet & Dry at this point...While the dry/cracked skin is now soft, it'll be easier to remove the majority of the skin. Put a foot mask on. Yup, this LUSH Volcano foot mask...is everything. With such key ingredients such as Papaya, Pumice, Tomatoes & Lemon Oil, smothering the feet with this mask being generous, covering the feet all over & leaving it to dry with a plastic bag (I use the fruit & veg clear bags) over the feet. As it begins to set it tingles, giving this warm, cooling feeling, you know it's doing its job. I leave it on for as long as possible, sometimes up to an hour, it'll be nice and hard and ready to be rinsed off. As you begin to rinse this off, use your hands to rub the mask into the skin as you're removing it. Take advantage of that pumice in the mask and rub and rub generously on those problem areas which for a lot can be the heels and balls. Once it's all off I dry my feet, making sure the inside of my toes are dried. 4. Sand Off The Scales & Moisturise To Be Godly. Once dried, I use the Velvet Smooth Wet & Dry Pedi. Go over the feet to get rid of any dried skin! My feet at this point feel soft and look refreshed! I'll finish by putting the Scholl Velvet Smooth Intense Serum & I will push back, cut, file and put a clear polish or white polish finish with cuticle oil. Before bed I'll put on an intense foot mask or a emollient and put on moisture socks - very important, I fall more in love in the morning. How Do You Keep Your Feet Fit For A Queen? - Winter Footcare guide with Scholl Express Pedi. - Last Footcare Routine w/ Scholl. I have been looking for a foot file for ages and the fact that this one operates wet and dry is fantastic news! Some great tips! I have a hate-hate relationship with my feet, but I do love my little Scholl pedi tool - I'll look out for this new one! I LOVE the Lush Volcano foot mask. I don't drive and walk everywhere, so I try to look after my feet. I've honestly never tried the Scholl buffers though. I'm a bit behind the times with my pumice stone. Maybe t's time for an upgrade!